Undercurrents hosts various video training workshops for all ages and abilities. We teach how to use a video camera, edit digitally on Final Cut Pro and upload videos to the internet. Undercurrents worked with a group of young people (14-17) to make a video about the Olympic ideals. The winner from the Film Nation competition was announced at an awards ceremony in October 2011. The video was shown during the Olympics in 2012. In 2012 this training project finished (after 2 years). Swansea Telly is an online video channel for Swansea. All the videos have been produced by people from Swansea as part of a digital inclusion project funded by the Welsh Government communities 2.0 programme. This is an innovative collaborative Digital Inclusion Project training minority groups in all aspects of media production, to create content for an online video channel - Swansea Telly. Do you have a video camera and a computer? 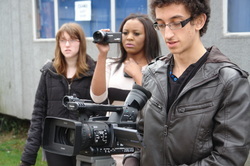 Do you want to be taught how to film and edit a news report? Would you like to join a network of motivated people filming their own news? Undercurrents is seeking people to join a 'Citizen Journalists Network'. Our partner organisation is VisionOn.tv and they offering training to nurture a UK wide network who will be encouraged to support their local community and campaign groups by producing regular video clips about local positive news. Find out more and for workshop dates across the UK.